Be the change. Become the solution. The E.D. Edwards coal plant’s toxic SO2 plume puts Peoria families at risk. PEORIA – Dangerous sulfur dioxide (SO2) pollution from the E.D. Edwards coal-fired power plant threatens the health of thousands of Peoria and Tazewell County residents according to a new air modeling study released today by the Central Illinois Healthy Community Alliance. According to the modeling study, the E.D. Edwards coal plant is allowed to emit toxic SO2 pollution at up to 7.5 times above the limit the Environmental Protection Agency (EPA) says is required to protect public health. The decades-old E.D. Edwards coal plant is currently operated by Ameren, but the coal plant is part of Ameren’s no-cash sale of five Illinois coal plants to Texas-based energy company Dynegy. The coal plant currently does not have any modern and widely available sulfur dioxide pollution controls installed. Sulfur dioxide, or SO2, is a harmful air pollutant. The Environmental Protection Agency (EPA) sets limits on how much can accumulate in the air we breathe. SO2 triggers asthma attacks, airway constriction and other respiratory problems. With Dynegy poised to take over the plant from Ameren, area residents are concerned that the company lacks a plan to clean up the plant. The Illinois Pollution Control Board (IPCB) is currently reviewing Dynegy’s request for permission to delay installing vital and widely-available pollution control technology until 2020. Coal-fired power plants like the E.D. 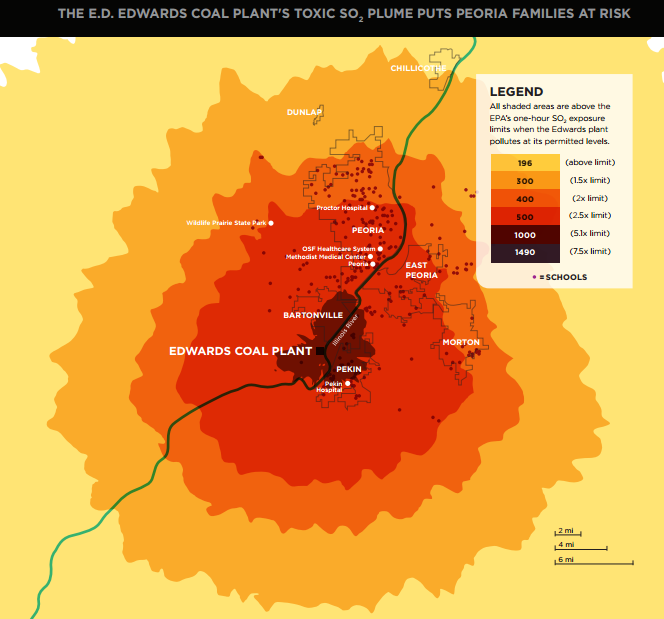 Edwards plant are the largest source of SO2 pollution in Peoria and Tazewell counties, as well as nationwide. Old, dirty and uncontrolled plants like the Edwards plant threaten public health by emitting concentrations of pollution in excess of what the EPA says is safe. The coal plant’s uncontrolled emissions were analyzed in light of the new, more stringent EPA standard for SO2 that reflects the up-to-date scientific consensus on what levels of SO2 present a risk to nearby communities. Wingra Engineering, S.C. completed the air quality study, which used an EPA-approved air quality dispersion model and publicly available data to evaluate pollution from the Edwards coal plant. The engineer ran the model following EPA procedures for evaluating the impacts of power plant SO2 emissions. This does not reflect the E.D. Edwards plant’s current air permit’s extremely lenient 24-hour averaging time for SO2, which allows hourly emissions to spike. Under the Clean Air Act, the EPA establishes National Ambient Air Quality Standards (NAAQS) for pollutants such as sulfur dioxide that harm public health. The Clean Air Act requires the EPA to revisit ambient standards for pollutants such as sulfur dioxide every five years to ensure the levels keep up with the best science regarding the threat of air pollution to public health. In June 2010, the EPA finalized a standard for sulfur dioxide setting a ceiling for ambient concentrations of the pollutant on a 1-hour basis to protect against short-term spikes in sulfur dioxide pollution, which the EPA found can have an adverse effect on at-risk populations such as children and the elderly during spikes in pollution in intervals as short as 5 minutes. For more information visit http://www.epa.gov/airquality/sulfurdioxide/. To view a fact sheet on the sulfur dioxide (SO2) air modeling study and pollution in the Peoria area, please visit: sc.org/1cgPZTQ. The Central Illinois Healthy Community Alliance (CIHCA) is a coalition of individuals and organizations committed to creating a sustainable and healthy community for Central Illinois. CIHCA is concerned about the decades of air and water pollution created by the Edwards coal plant south of Bartonville. CIHCA is working to retire the Edwards plant and transition Central Illinois to a cleaner energy economy by reducing energy use, and moving to renewables such as wind and solar, and requiring a just transition for workers. Sign up for our email list to receive meeting reminders, event notifications, and other green stuff by sending an email with "subscribe" in the subject to todd@gwsolutionsgroup.com.